On the afternoon of our first full day on the Lyon and Provence cruise, we booked an optional tour to the ancient Roman aqueduct bridge at Pont du Gard, a short ride from our docking location in Avignon, even with a brief delay provided by a lingering mid-week Yellow Vest blockade at a nearby rotary. 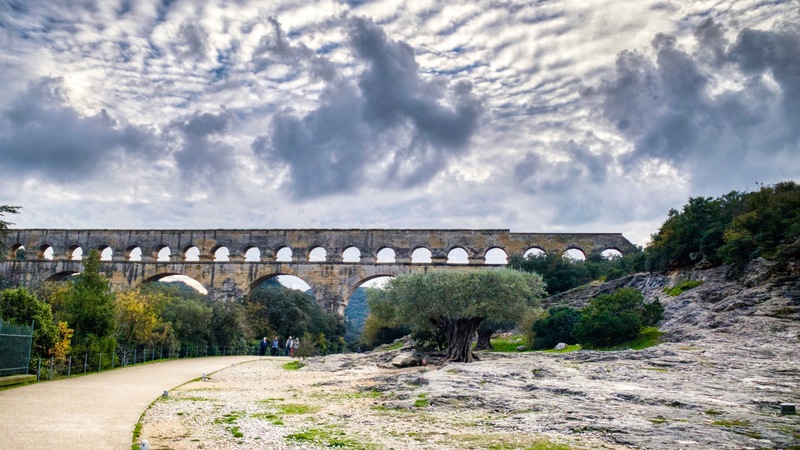 We had already visited the Arena in Arles and the ruins of Glanum in Saint Rémy, so we were feeling pretty well tuned in to all things Roman in France, but Pont du Gard took things to a whole new level. Built in the middle of the first century, A.D., this 160 foot tall span (highest of all the Roman aqueduct bridges) arching over the Gardon River was part of an aqueduct system that brought water 31 miles over a winding route from a spring northwest of the site and then southwest to the city of Nimes. In those 31 miles the water level only drops on average one inch per 250 feet, and even less (about an inch per 1500′) while crossing this bridge, which helps provide a sense of the level of precise engineering required of its Roman builders. 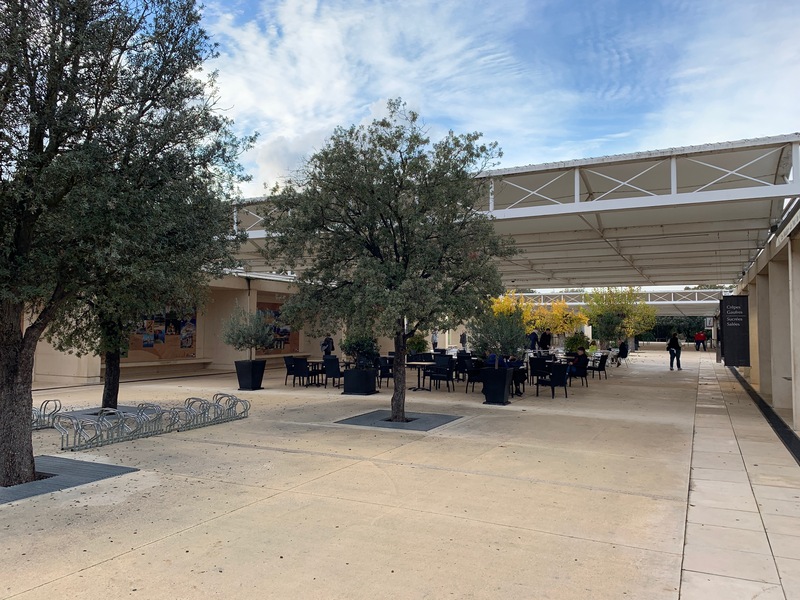 At the entrance to the site, our Viking guide pointed out the highlights in a museum that provides a history of the water system and the Pont du Gard and how it was built. Thirty-five of the bridge’s original 47 arches survive. In the intervening centuries stone from the Pont was “borrowed” as building material elsewhere. The missing arches do not take away from how impressive the work is as you approach. 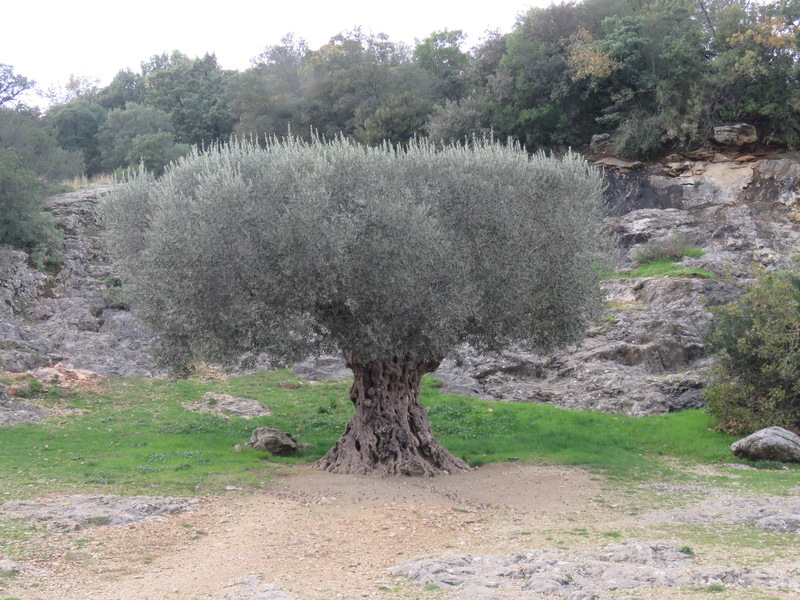 Next to the path on the way to the aqueduct there was a small grove of 1000-year old olive trees transplanted from Spain. As ancient as they are, it’s hard to believe that they’re only half as old as the Pont du Gard. It’s hard to appreciate the impressive scale of the aqueduct just by looking at pictures. It is massive, while also feeling delicate with its high arches. Pont du Gard crosses over the lovely Gardon River. Just as we arrived the afternoon sun came out, with the aqueduct bridge casting a distinctive shadow across the downstream terrain. The 160′ height of the aqueduct is imposing, but the details of the workmanship shown in the photos below are even more amazing when you remember that this structure was built largely without any mortar with the stones cut to fit together precisely. The “bumps” that you see on the pillars were used to support scaffolding during construction. When it was still in operation, most of the length of the aqueduct was underground. We climbed up a steep trail to the top of the aqueduct. There we could see a tunnel that was cut through the stone, while many portions of the water system were covered by arched stone roofs. The water coursed across the top of the aqueduct in the channel shown below. After returning to the ship for dinner, the Viking Heimdal sailed south towards Arles. 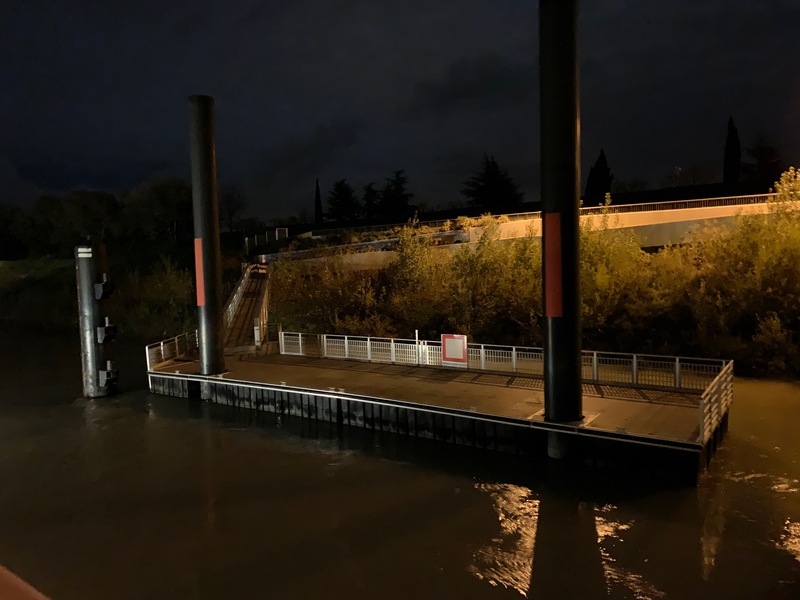 Later on in the evening we pulled into our docking location at Tarascon, where we would depart in the morning to spend more time in Arles, this time accompanied by Viking guides and fellow passengers. As usual, really enjoyed the pics! !